Rany on the Royals: Top Moments (#90 - #81) of the 2014-2015 Kansas City Royals. Top Moments (#90 - #81) of the 2014-2015 Kansas City Royals. This group of Moments include a pair of wild and memorable defensive plays, three tie-breaking home runs, and the wingmen in some of the most important rallies of the last two years. And we’re still not in the Top 80. Summary: With the go-ahead run on third base in the bottom of the 7th of the ALDS opener, Nori Aoki atones for a bad route on C.J. Cron’s fly ball with a terrific, game-saving catch. THIS GAME. OH MY GOD THIS GAME. How do you describe Nori Aoki? The best I can do is call him baseball’s version of Bean – a comically clumsy player who is constantly stumbling into good fortune. There may be no finer exhibit of both those traits than this play, coming just one inning after Aoki saved Jason Vargas and Ned Yost with one of the most unlikely catches I have ever seen. This catch wasn’t nearly as unlikely, or at least it shouldn’t have been before Aoki used his route to pay tribute to Magellan. Um, are all playoff games like this? How are all of you non-Royals fans still alive? Game 1 of the 2014 ALDS was still tied in the bottom of the 7th inning when Kelvin Herrera began the inning by walking David Freese on five pitches – and then came out of the game with an elbow issue that had us all convinced he was about to undergo Tommy John surgery. (Instead, he was back in action three days later for Game 3.) Brandon Finnegan replaced him and gave up a sacrifice bunt to Erick Aybar, followed by a groundout to Josh Hamilton that moved Freese to third base. Ned Yost then called on Wade Davis to face C.J. Cron with the go-ahead run 90 feet away and two outs. On the first pitch, Cron hit a deep fly ball to right field. Aoki turned and ran almost directly to the wall, and then, realizing that the ball was not only hit behind him but also well to his left, made a 90-degree turn and started running parallel to the wall along the warning track, before making a diving catch to preserve the tie. It shouldn’t have been this dramatic. Had Aoki run a better route, this play wouldn’t rank in the Top 100. But then we wouldn’t have had this Moment, and the past two seasons would have been that tiny bit less fun. Remember: Nori Aoki is what you get when you cross Ichiro Suzuki with Benny Hill. Which may be why I've laughed like a hyena twice tonight. Summary: After Mike Morse flies out to right field, Nori Aoki’s relay throw gets past the mound, but Yordano Ventura’s astute play and Omar Infante’s great tag manage to double up Brandon Belt to end the inning. Ah yes, I was there at spring training the day they rehearsed that play. What was that I said about Aoki? In Game 2 of the World Series, the Giants had just tied the game in the top of the 4th on Brandon Belt’s one-out double, in a game the Royals pretty much had to win. Mike Morse then batted, and on Yordano Ventura’s eighth pitch he lofted a shallow fly ball to right field. Belt faked towards third after Aoki caught the ball, with no real intention to try to advance with two outs, but when Aoki’s throw back to the infield got away from Alcides Escobar, Belt thought about it again and briefly tried for third. But Ventura, backing up the play, made a nice dive to keep the ball from rolling towards the dugout, got up and whirled a throw to second base, where Belt was desperately trying to get back. Ventura’s throw was high, but Omar Infante made an excellent play to catch the ball and get the tag down on Belt’s helmet just before he touched the base. The inning was over with the score still tied; the play would appear even more important when Travis Ishikawa led off the 5th inning with a single up the middle, and again when the game remained tied until the 6th before the Royals broke the game open with five runs. Summary: Alcides Escobar homers – over the fence! 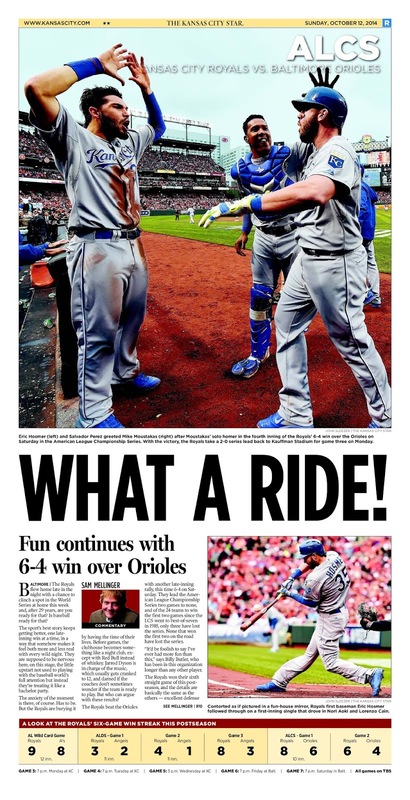 – to open the scoring in the 2014 ALCS. I thought home run power would be a key for the Royals if they want to win this series. Just didn't figure on it coming from Escobar. For his career, Alcides Escobar has just 24 home runs in 973 games – one homer for every 40.5 games. In the playoffs, though, he’s hit two homers in 31 games. Granted, one of those was an inside-the-park “home run” off Yoenis Cespedes’ leg, but the other one cleared the fence. This is that home run, and it came at an opportune time, driving in the first run of the 2014 ALCS. With one out in the top of the 3rd inning, Chris Tillman left a 2-0 fastball up and over the plate, and even Escobar knows what to do with a pitch like that. The narrative of the 2014-2015 Royals has so many unlikely storylines that it would make for a terrible piece of fiction. This is one of those storylines. 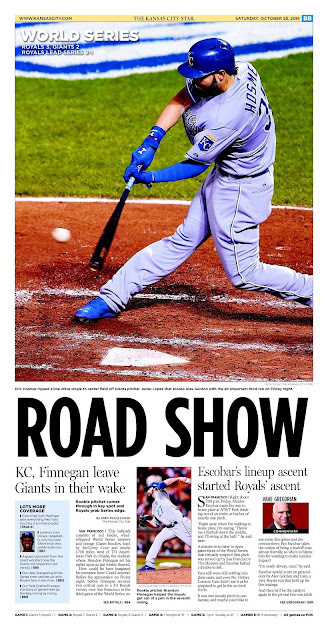 Summary: Eric Hosmer hits a two-run homer for the second straight game, putting the Royals in a commanding position to sweep the 2014 ALDS. SOMEONE CALL THE COPS. ERIC HOSMER JUST MURDERED A BASEBALL AGAIN. The Royals were already in an excellent position to sweep the 2014 ALDS, having taken a 3-1 lead in Game 3 at home. And then Eric Hosmer got a 2-0 fastball from Hector Santiago right down the middle with a man aboard and absolutely crushed the ball to the opposite field, showing the kind of power that makes you wonder how it is that he’s still yet to hit 20 homers in a season. The home run didn’t quite ice the game, but it definitely started the party at Kauffman Stadium, one that Hosmer would make sure continued after the game at McFadden’s. Summary: Mike Moustakas breaks a tie in Game 2 of the ALCS with a two-out, two-strike home run that just clears the right field fence. Just as we all thought. On Draft Day, 2007. A general rule of thumb: when the #9 hitter in your lineup hits five home runs during the postseason, you’re probably going to have a good postseason. This home run by Moustakas, coming as it did in the 4th inning, wasn’t his most dramatic home run, but it did come with two outs in a game the Orioles had just tied in the bottom of the 3rd on Adam Jones’ two-run homer, so it was a pretty big deal in its own right. Bud Norris threw an 87-mph slider that didn’t slide enough and stayed in the strike zone, and Moustakas put a classic uppercut swing on the ball, driving it just over the 18-foot scoreboard in right field. The Orioles would tie the game again on an RBI groundout in the 5th, and the game would remain tied into the 9th. So if this fly ball travels a few feet shorter, the entire game plays out very differently. Mike Moustakas has hit four homers in a five-game stretch for the first time in his career. Summary: Ben Zobrist sneaks a home run off David Price inside the left-field corner to open the scoring in Game 6 of the 2015 ALCS. In Game 2 of the 2015 ALCS, Ben Zobrist got the Royals’ first rally going with a pop-up to right field – and slammed his bat down in disgust. In Game 6, again facing David Price but this time in the 1st inning, Zobrist got the Royals’ first rally going by drilling a 1-1 cutter on the inside part of the plate into the left field bleachers – and this time he gingerly laid his bat on the ground before making his circuit around the bases. While the box score doesn’t show it, the Royals were absolutely scorching the ball against Price early in the game – all three groundouts in the 1st inning were hit hard, and Kendrys Morales led off the second with a drive to the warning track before Mike Moustakas hit his controversial home run. Price would eventually settle down the way an ace is expected to do, and kept the Blue Jays in the game. But for the second time in the series, Zobrist hit a home run in his first plate appearance to put Toronto on the defensive. The Royals made sure there wouldn’t need to be a third time. Summary: Eric Hosmer culminates an 11-pitch battle with Javier Lopez by singling home an insurance run in the 6th that would prove crucial when the Royals won by one run. Hosmer’s RBI single in Game 3 of the 2014 World Series is not the most important at-bat of the last two years, and it’s not the most impressive hit of the last two years. But it could very well be the most impressive at-bat of the last two years. Start with the fact that it was an 11-pitch at-bat, which at the time tied it for the longest plate appearance in Royals postseason history. (We don’t have pitch-by-pitch data for the 1976 and 1984 playoffs, and the first two games of the 1985 ALCS. Also, Alex Gordon broke the record with an epic 12-pitch battle with Lance McCullers that he lost – he flew out to left field – in Game 4 of the 2015 ALDS.) Only one other Royal in the playoffs – Frank White against Joaquin Andujar, while the Cardinals were melting down in the 5th inning of Game 7 of the 1985 World Series – has ever ended a plate appearance of 11 pitches or more with a base hit. And then there’s the impact of this hit, which seemed like it merely provided an important insurance run at the time, extending a 2-0 lead to a 3-0 lead in the 6th inning. But it became a lot more important after Jeremy Guthrie gave up two runs in the bottom of the inning, and the bullpen held on to get the final nine outs. I could easily make a case to rank this Moment much higher. The only problem with that is that I’d have to rank another Moment lower. There were 83 of them that I simply couldn’t justify that for. 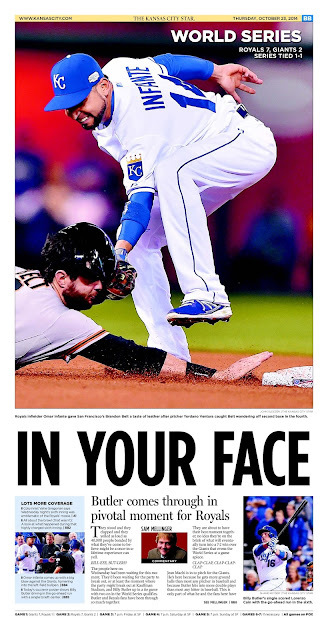 Summary: With the Royals losing in Game 5 of the ALDS, just 15 outs from elimination, Alex Gordon hits a ground rule double to put the tying and go-ahead runs in scoring position with no outs. The Royals had fallen behind in a winner-take-all game, 2-0, on Johnny Cueto’s one mistake of the game, and while the Royals had gotten one run back in the 4th when Lorenzo Cain had scored from first base on Eric Hosmer’s single – not the last time that happened in the playoffs, keep in mind – they still trailed with 15 outs to go. But then Perez, leading off the 5th, was hit by a pitch on a full count – keeping him from walking for the third time in the series – and then, again on a full count, Gordon got a cutter from Collin McHugh that crossed the heart of the plate and pounded it over the head of George Springer, who was playing surprisingly shallow in right field. The Astros caught a break when the ball bounced into the stands, forcing Perez to hold at third base, although there’s a good chance Perez would have been held up with no outs anyway. For the first time in the game, the Royals had put themselves in excellent position to take the lead, and Rios would make sure they did just that shortly thereafter. Rios gets all the glory, but it was this hit that set it up, and in fact Gordon’s double had a slightly higher WPA (16%) than Rios (15%). Summary: With the bases loaded and one out, Salvador Perez walks – on four pitches! – against Josh Fields to tie Game 2 of the 2015 ALDS. A SALVY PEREZ FOUR-PITCH RBI WALK. I HAVE SEEN AMAZING. The Royals don’t make it to Game 4 of the ALDS without their comeback in Game 2, in which they trailed 4-2 in the bottom of the 6th inning. With one out, Lorenzo Cain doubled, Eric Hosmer singled him home, Kendrys Morales singled past the shift (Moment #97), and Mike Moustakas worked a five-pitch walk against left-handed specialist Oliver Perez, and suddenly the bases were loaded with one out and the tying run at third base. And then something even more amazing happened: after A.J. Hinch called on Josh Fields to face Salvador Perez, Fields walked Perez on four pitches – the last pitch was so wild that it got away from the catcher and nearly beaned Perez – to force home a run. How unprecedented was this? It was the first bases-loaded walk of Perez’s career. The game was tied and the bases were still loaded with one out, but with all of the meaningless momentum suddenly on the Royals’ side, Fields faced Alex Gordon and…struck him out. (Apparently Gordon was waiting for later in the series to come through with the bases loaded and one out in a tie game.) Fields then struck out Alex Rios to keep the game tied going to the 7th. But of course we have more Moments from this game left to come. Summary: Alex Gordon caps the greatest rally in Kansas City Royals history with a slow, run-scoring groundout to the right side, driving in the go-ahead run in the Columbus Day Comeback. TEAM CONTACT STRIKES AGAIN. I LOVE YOU GUYS. What was that about Alex Gordon waiting for later in the series to come through with the bases loaded and one out in a tie game? After Drew Butera’s miraculous walk (Moment #100) against Luke Gregerson, Gordon batted with the bases loaded and the game tied and just one out, needing only to make quality contact to plate the go-ahead run, and did exactly what the situation called for. Gregerson’s 1-1 pitch was low but over the plate, and Gordon pulled a slow ground ball between second and first base. It might have been a double play had Jose Altuve been positioned in the perfect spot (although the ball was probably hit too slowly for a double play to be turned regardless), but with the infield in, Altuve had to dive just to glove the ball and had no play anywhere but at first base. In the span of the most remarkable half-inning in Royals history – I don’t think that’s an exaggeration – the Royals had turned a 6-2 deficit into a 7-6 lead. Their odds of winning the game had increased from 3% to 76%. Their odds would increase even more when Alex Rios then walked to re-load the bases, but Alcides Escobar was then called out looking on a questionable pitch to end the inning. No matter. The Royals had the lead. Wade Davis was walking in from the bullpen. The Miracle at Minute Maid was nearly complete. Just one little correction for moment 83. The header has this as game 4, not 5. Wow, 81? I expected that Alex Gordon go-ahead hit to be in the top 10! Two more small corrections: in moment 89, it was Brandon Belt, not Hunter Pence that was out at second. And Moment 88 occurred in the top of the 3rd, not the top of the 1st. I absolutely love this effort. I don't know how you have the time to put this all together. It is fantastic! I would concur that if you published this in hardback it would sell but in all honesty just publishing it in PDF format with hotlinks to make it searchable would be something I would gladly pay to own. It is better than any documentary or collection that MLB or the Royals could put together. I love the Tweets as it shows that this isn't just a retrospective but is done with the fandom of someone who hung on every pitch.